Ida’s or more formally Champion Karesama Silver Seanymph’s delightful kittens. 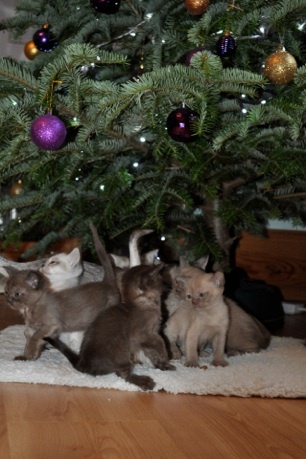 Shown here at only 5 weeks old, they’re already getting into the Christmas spirit!! Superbly affectionate with an exceptional pedigree, these babies won’t have any trouble finding the purrfect home!! Available to take home in March 2011. Reservations now being taken.